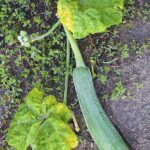 Why do I get blossoms on my squash plants but no squash? It has been very humid; if that is the problem, will they still set 'fruit'? Could it be lack of water? Should I be hand watering daily? The same thing happened last year. They are planted near tomato plants. . . could that be a problem?